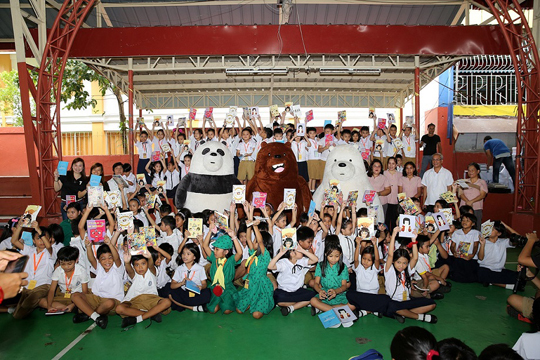 More than 1,000 students from Dela Paz Elementary School in Pasig City have received special notebooks as part of a Cartoon Network initiative. The covers were designed by talented Pinoy students who entered the Cartoon Network ImagiNATION Building Notebook Design Contest. “At Cartoon Network, we want to inspire kids to be creative leaders, one notebook at a time. Through the contest, kids were not only able to express themselves but could also act as role models, encouraging other kids to also hone their skills,” said Jia Salindong-Du, Country Manager of Turner Philippines, the company behind Cartoon Network. At a recent event at the school to announce the winners, the students said that they were really inspired by the designs. They were also excited to receive their notebooks from Grizz, Panda and Ice Bear from the show We Bare Bears, who made a special appearance. For more information about the event and other Cartoon Network-related news and updates, log on towww.cartoonnetworkasia.com or follow Facebook.com/CartoonNetworkAsia.